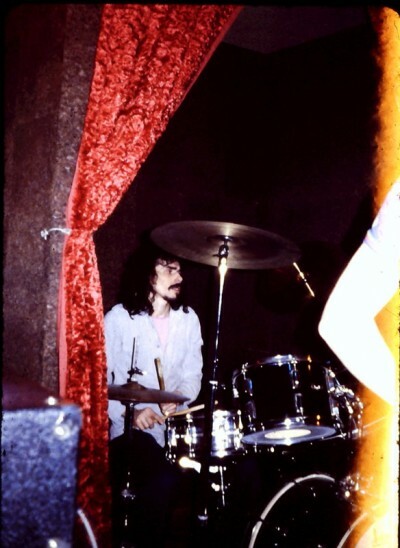 Roy Mortimer (AKA The Captain) is sadly not with us anymore, he was a very good mate of mine for many years, I actually knew him at 5 years old from primary school in Cheadle Hulme where we both came from, Roy was the drummer in the first ever incarnation of 'The Ride' in 79/80 and later joined up with 'The Knives'. At this time he had also won a competition at Hard Rock, the first prize was to go on one of 10cc's European tours, he went on the tour and 10cc liked him so much they took him on as full time PA for the band, this entailed hanging out at Strawberry until the band needed him to 'get things' for the sessions, he also did stuff like throwing hundreds of buckets of water up the wall at back of studio for the flood bit in 'Consequences'. I remember that Eric Stewart coming back from London on the train saw a Ford Cortina in a garage with the registration ROY 1, as soon as he got off the train he phoned the garage and bought it, once he had the keys he wrapped them up and gave them to Roy with the address telling him not to open the box until he got there! RIP Roy, you looked like a star and you were one. Thanks Abigail, looking through my archives for 'Knives' stuff I found this and about 160 more 35mm slides of Bootleg and 9 more singles from Dave Powell, Freshies and Victim, I rushed out to buy a slide scanner and am currently looking at stuff I have not seen for 32 years eeek! Bonus is that other memories come back with them! !